Well we have had another busy but really awesome week here in the office. It has been really fun and it was nice to have a little more time to work in the area where we really are seeing some miracles. So on Tuesday we recieved some more missionaries. Two from Brazil and one from Buenos Aires. It was pretty fun hanging out with them for the day. It was one elder and 2 sisters so we were doing a lot of stuff with the elder. His name is Elder Haddad and he is pretty much the coolest guy ever. He even knows who Greg Ostertag is so that was pretty fun to talk with him. 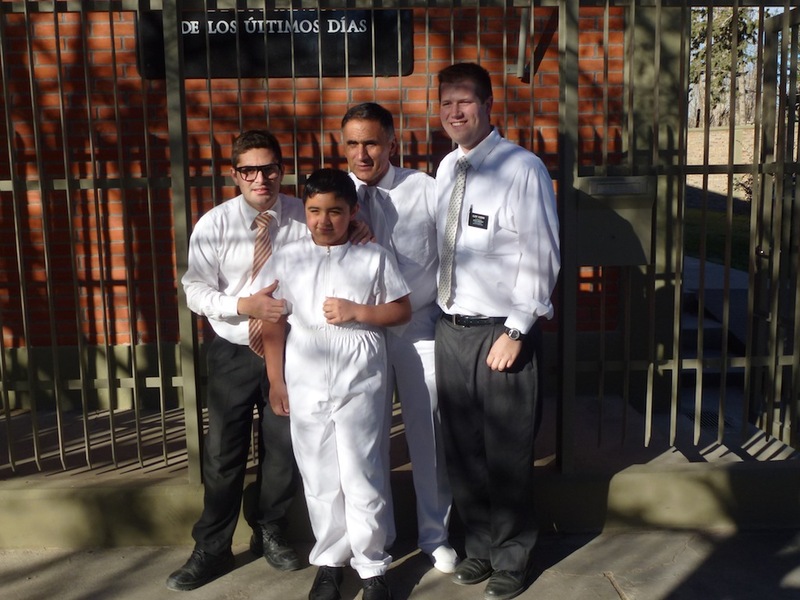 He went to be in a trio with Elder Kimball and his companion so I´m sure they will all have a good time over there. The next day we recieved two more Bolivians but they didn´t come in till 1:00 at night so we didn´t get to know them very well. What was really tough is that the next morning we had to leave to go to Zapala at 5:30 so we didn´t get very much sleep. But we still had a good zone conference there but I´m a little glad that all the conferences are over now. Now we can relax a little bit. So while we were gone we were able to keep contact with some of our investigators. We are teaching a part family. Matias is a less active memeber and her girlfriend is Romina. They have been haveing some problems which has keept them from getting married. But we had a really good lesson about the atonement and forgiveness before we left to go to Esquel. So this week we had a lesson with them and they told us that they had set a date to get married! Its a pretty crazy story. One night Romina wanted to do a family home eveing and Matias said to open Gospel principles to figure out what to talk about and justo she opened to the law of chastity seccion. After going over the seccion she said well when are we goign to get married. So that was really awesome to see the Lord´s hand in that. We were able to put a baptismal date with romina for the 31 of August so we really are blessed for that. Well I love you all I hope you have a wonderfull time in Fish Lake. Love you all! Sorry i haven´t sent any pictures but I am having problems with my sd card. Whenevery i put it into the adapter it show up on the computer. But when I open the extractable disc the picture file doesn´t show up. I don´t know what the problem is. Hopefully next week I´ll be able to get you some pictures. Well we sure had a crazy week with traveling and training meeting and all that stuff but it was also really exciting and we are continuing to have success. So I will start off with Sabrina. She is pretty much a golden investigator. She already has a testimony and she said that she already knew that she was going to get baptized in the futrue just didn´t know when. She had a baptismal date for the 20 of july but we asked her how she was feeling about that. She said that now she is pretty much just waiting for the date to come. We asked her if she would like to do it a week earlyer and she said yes. So this weekend Sabrina will be baptized! It will be a really special moment because she and her husband have been having some problems in the past but I know that this gospel will bring them together. Guille, her husband, is really excited to start going back to church. They also have the cutest little daughter, its just an amazing family. We truely are blessed to find somebody so prepared. This week we were also able to find somebody else who the lord really has prepared. His name is Sergio (we are teaching like 3 Sergios right now). He is the boyfriend of a less active member, Brenda. Brenda´s sister just left of a mission a month ago and really has had desired to go back to church. Sergio has already been to church quite a few times and really wants to know more. He really likes talking with us and also likes going to church. So we will start working with them and hopefully get Sergio with a baptismal date. Things really are going great here in Zapala. In the zone leader council I asked president if i could stay and he said no haha so I´m pretty sure this is going to be my last week here in Zapala. We will have to work hard to make sure that this area keeps going but it will be fun. The lord sure has blessed us in Zapala and I know that he will continue to do so. I love you all and hope you have a wonderfull week! Well today was a pretty crazy week but with lots of really cool things that happened. So I will start with Sergio. He was baptized on Satruday! It was pretty sick. He really loves the gospel. We had to teach him everything in one week and he accepted everything. He stopped smoking and committed to live everything. Such a capo! Yesterday the Venegas family invited him to eat lunch with him and we asked him if he would share the scripture. And he shared the sickest scripture in 2 Nefi 25:29. Man he shared that scripture like he was a member all his life. It was such an awesome feeling. We surely are blessed to have been able to find him and baptize him. This week we were also able to do divisions with some other elders here in Zapala. I went to the other area and when I got back, my comp told me that they started teaching Luciano´s sister in law who is not a member. We went by again and she is awesome and already has a testimony of the church. She now has a fecha for the 20 of july so that will be super awesome. This week was also a fun opportunity to do divisions with Elder Kimball in Cutral Co. It was fun to be companions again. Just like in the good old days in the MTC. We had a lot of fun and we had a lot of success as well. He is opening the area and we were able to find some new investigators for them. I´m sorry that this letter is a little short and summed up but my time is running out. I love you all so much and I hope you have a wonderfull week! Well this was a pretty great week and we continue to see the hand of the lord in this wonderfull work! First off I would like to start with Sergio. You may remember that he came to church 2 times but we were never able to find his house. Well we lost contact with him because he didn´t come to church last week. But on Saturday just before leaving the apartment in the morning my comp and I prayed that we could find Sergio again. As we were walking to lunch lo and behold we found Sergio! He was busy doing some errands and stuff but we told him that later in the afternoon we had an english class in the church and he said he would be there. He came to english and after we had a charla with him and we invited him to be baptized. He accepted. We had a prayer at the end of the lesson and he said it. We told him to pray to know if these things were true. After the prayer he told us I know this is true. It was so awesome. The Lord really had prepared Sergio and if all goes well he could be baptized this weekend. We are so blessed and I know that Heavenly Father answers prayers. So this week was had interviews with the president. The were awesome. The assistants did a workshop about the atonement while president was calling everyone for their interview. The workshope was awesome. They had a bag of charcol and we had to get our hand all dirty and stuff. and they tied it in with our missionary purpose and how through baptism we can be clean again. The interview with president was great. He told me as well that it is very likely that I will be leaving Zapala at the end of the transfer so we will see how that goes. So last night I was able to watch the broadcast. It was pretty awesome. I love it how that showed how through little small things like inviting people can help people accept the gospel. It really made me excited about the work in the future. Well I love you all and I hope you have a wonderfull week! Here is a picture in San Martin. A lot of the snow had alread melted but the mountains are beautiful. 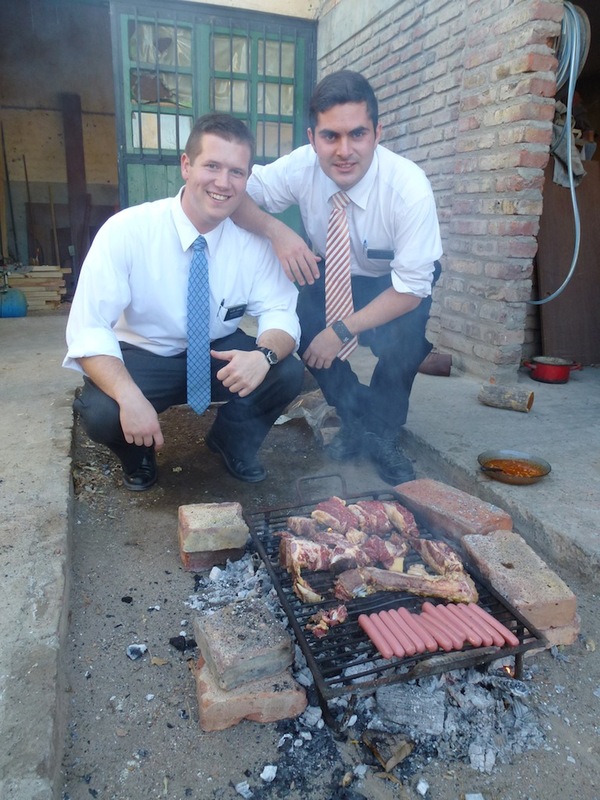 With Elder Suarez in San Martin. Well we sure had a pretty good week. We saw a lot of cool things happen in the area and a couple of miricles also. So this week Luciano got baptized. It was a pretty sweet service because the family is so big so there were a lot of people there which was really sweet. Lucianos dad baptized him which was a sweet thing to see. The family was inactive for about 10 years now and now the are back and strong again. It was a really sweet moment for the family. Yesterday he was confirmed by his brother in law which was also really cool to see. I hope this family will continue progressing and enduring to the end. We also made a ton of progress with our investiagator Omar. We went and saw him friday night and was had a good chat with him and invited him to the bapismal service. He came and had a really good experience. After the service we had a lesson with him in the church with the bishop. It was just a really awesome lesson and the spirit was super strong. He told us that he loves it when we come by because he just feels so much better when we talk to him. He is really lonely and has a lot of pain in his life and he says when we teach him it goes all away. We comitted him to go to church and he came. He made a really big sacrifice as well. He works all night from 11 to 8 in the morning. He was really tired but he made it through church and had a great time. I´m not sure if I have seen an investigator progress as much as he did in a week so that was awesome. Hopefully we can help him continue to progress for his feca on the 6 of july. Well things sure are going really well in the area and also in the zone so everything is just going awesome right now. This week we are going to San Martin and we also have interviews with the president so it should be another good one. I love you all and hope you have a wonderfull week! Here is a picture of the baptism. Last week on p day we had an an asadito with some hot dogs. it was pretty good. Elder Hudgins and Elder Suarez. Hello everone. Well this week has been pretty fun with my new comp. Elder Suarez is pretty awesome and really animated about the work and we have fun with it. He only has 9 months in the mission so he is still a little fresh which is awesome. Even though we had a tough start to the week we still had fun and we were really blesses yesterday on Sunday. The assistants called us and told us to focus on getting references and putting new fechas but we were haveing no success during the whole week. We couldn´t find anyone that we wanted to put a fecha with. But we kept at it and finally on suday we finally found some of our investigators. We were able to find Hector who was a reference and has already gone to church with the Hermanas in another ward. We taught him and he accepted a fecha easily. He really wants to follow Jesus Christ and I know this gospel will help him do that. We were also able to find Omar. We had a great lesson with him but we really have to help him pray so he can get his answer that these things are true. But I know if we can do that we will start progressing well. Last night we were also able to see a miracle. It was like 8:50 at night and we were just waiting for 9 to come around to go back to the apartment. We started to do contacts around the apartment and we found a family that their jeep had ran out of gas. Now the gas station was like 5 blocks away so we offered to help push the jeep the 5 blocks. It was pretty cool because they were really greatfull that we were there to help him. They offered to drive us back to the apartment and we started talking and the dad said, well I think God put you in that place because there was no way I was going to get the jeep to the gas station by myself. He was really awesome and invited us to come to his house to share our message. So this week we will stop by and hopefully we will be able to teach this whole family. It was an awesome experience and I´m sure god did put us in that place for a reason. Well I love you all and hope you have a great week! Well we have had a pretty crazy week here in Zapala and a lot of things have gone about. So I guess I´ll start with the transfers. So as you already know Elder Wagstaff left to go be the new assistant and so that means that I´m just staying here in Zapala with my fourth companion. His name is Elder Suarez. He is from Uruguay. I met him while I was in Trelew and he is pretty awesome and I´m really excited that he is coming here to be my comp. So this week was another battle with sickness. Once again I cought a stomache bug and was out of work for 2 days and man was that a really boring 2 days! But now I´m doing fine and i´m at 100%. But I it was a tough week in our area because also earlyer in the week we went to do exchanges in cutral co. So thats 3 days that we wern´t able to work in our area. But I think its safe to say that the lord blessed us to make up for the lost time. This week we were able to find two sweet new investigators Hector y Carlos. Hector was a reference from the hermanas and has already been to church. He was super recieptive and while we were teaching him his Carlos came by and we were able to teach him as well. They are both really interested in the church and want to learn more and follow Christ as well. Another blessing that we got was on Sunday. but it started on Saturday night. 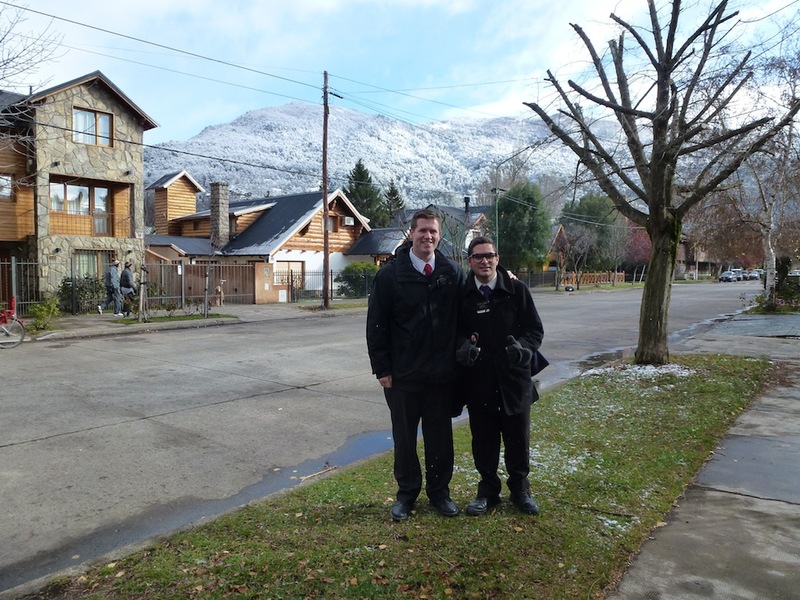 Elder Wagstaff and I were walking down the street and we said to each other that we hadn´t contacted pretty much anyone this week so we started to talk to all the poeple that passed us. We came upon a man named Sergio. It was a simple contact and we invited him to church. We weren´t sure if he was going to go because I realized that he gave me a fake address. But surely enough Sunday morning he shows up! We talked to him in between classes and said that saturday night he was thinking and he said that he grandpa is member of the church and wants to follow what he is doing. So he was super content to be there in church. He stayed for the whole three hours and we set up a cita with him for wednesday and got his real address haha. So another good piece of news is that Elder Kimball is coming to the zone! He is opening an area in Cutral Co and will be training as well and be the district leader which means I will be able to do exchanges with him shortly so that will be awesome! I love you all and hope you have a wonderfull week!